January 9, 1910 – The Chicago Daily Tribune runs a feature on the history of Michigan Avenue from the time of Fort Dearborn to the time of the Chicago fire in 1871. Today’s great boulevard began as an Indian trail, leading to the gates of Fort Dearborn at what is today Madison Street. An early resident recalled the early trail as “A brown path where the grass had been trodden out fed to the fort.” It was this Indian trail that the evacuees from Fort Dearborn used as they headed toward their doom in 1812, getting as far as what is today’s Eighteenth Street before hostilities began. By the time the little town on the river was incorporated in 1833 rude streets had already fixed its boundaries – Knizie Street on the north, Desplaines Avenue on the west, Madison Street on the south, and State Street completing the square. Michigan Avenue remained a well-traveled trail with “canal lands” to the east – the anticipated canal would originate, of course, at the mouth of the river and at the time the mouth of the river entered the lake at what is today Madison Street. There were some shenanigans that occurred in the 1830’s, not the least of which involved an early settler, General John B. Beaubien purchasing the reservation at Fort Dearborn for $94.61, a deal that the courts later ruled as illegal. Still, the fort’s property was platted, the river straightened so that it breached the sand bar and ran roughly in the direction it runs today, and streets laid out, running north and south, from Madison Street to the river. Beaubien Street, today’s Michigan Avenue, was one of those new streets. In 1852 when the Illinois Central built a trestle to carry its trains to the river along the lakefront, its right-of-way was fixed, using the west boundary of Michigan Avenue – 700 feet to the east of the west line of Michigan Avenue was to be the west line of the Illinois Central’s boundary. Using this calculation Michigan was extended to the southern city limits. At that point the road had little importance – in fact, as the article points out an early woodcut shows that what is today’s scenic boulevard was little more than a landing place for rowboats traversing the lagoon formed by the Illinois Central’s berm and trestle and the area where today’s Art Institute of Chicago stands. 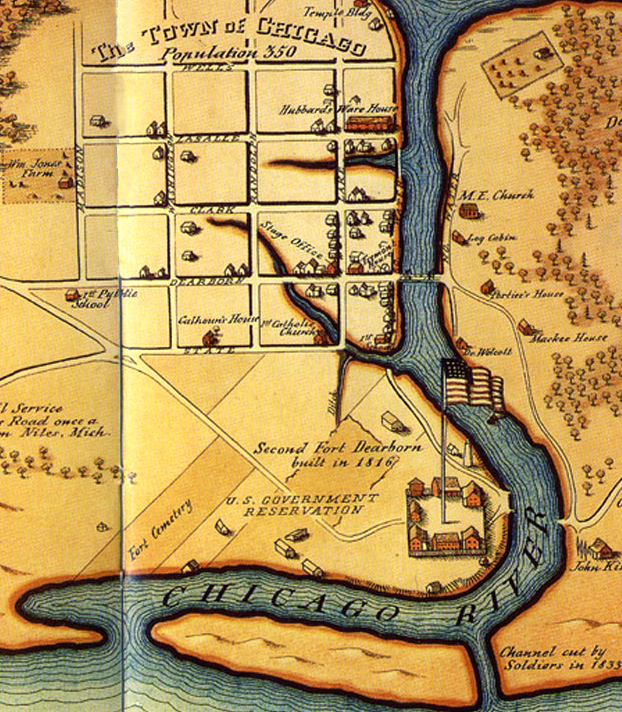 Note in the 1835 map above the new town of Chicago with a population of 350 souls has State, Wabash, Dearborn, La Salle and Wells Streets all neatly in place. Michigan Avenue is nowhere to be seen, aside from the old Indian trail leading to where the entrance to the original fort was located. 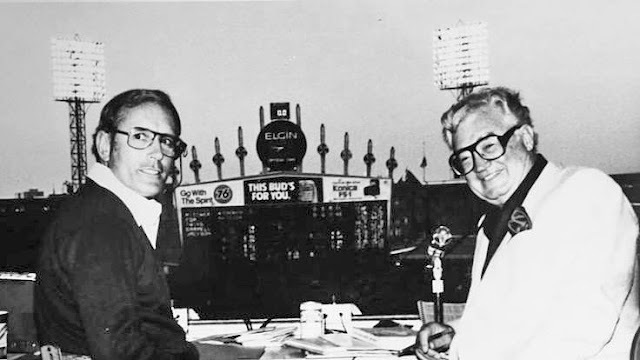 January 9, 1978 -- Harry Caray agrees to return to his post as the radio and television announcer for an eighth season with the Chicago White Sox after threatening to take a hike unless he was given a substantial pay raise. The Chicago Tribune quotes Caray as saying, "Let's face it -- until last season the Sox were a depressed product. They were in deep financial trouble. I went along without any raise primarily because of Bill Veeck. I was committed to helping him turn the club into a success. Now I think I should start making some money . . . If Brickhouse is making 150 grand, why should I make so much less?"